Drew’s library is a place for everyone to come explore, read, research, and be curious. The librarians, Mrs. Black and Mrs. Butler, want the library to engaging and interesting. Each week, every child will have the opportunity to check out books to bring home. The students may also be engaged in a lesson, reader’s theater, storytelling, singing, projects, guest speakers, technology lessons and much more. The current library schedule is: (link is being worked on). While the students have set days, if they want to come in at lunch, before school, or after school, or during the day, they just need to arrange this time with Mrs. Black and their teacher. More info will be shared concerning this later. In order to keep books fresh, we would like the students to bring their books back each week. Students may renew their books if they are not done with them. Below is the chart with how many books students may take out for the week. This will allow us to keep track of the collection. Finding just the right book is exciting for the children. Mrs. Black loves to hear the children talk about their choices and recommend books to her. Children from first grade through fifth are expected to know their student id number. Why? 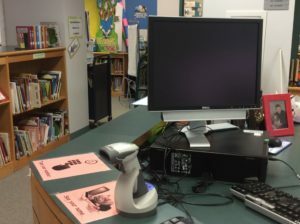 In the library, we have self check out. The children input their number into the keypad, hit enter, and then scan the bar code. We will teach the students who are new how to use this. Pre-K through Kindergarten will have help to do this. Library time is a moment to find a book about something THEY want to read or learn about. As parents, lets ask them about the book and have them read to us a few pages, the whole book, or their favorite part. The more they read, the better they will be!!!!!!!! Lets do this every night. Forgot to bring the books on Library Day! Oops! Times like this happen. On those days, Mrs. Black has a bin of books that the student may borrow from. They can take it with them and either keep it, or bring it back another time for someone else who forgot. Please try to keep the library schedule on your refrigerator. During the first two weeks, a “your library day is” bookmark will come home for you to put on the calendar. Nobody likes to have a lost book. Plan to have a special place to keep library books in your home. This could be by the bed, on the table, or in the backpack. If your child looses a book, just let us know. We will share the cost of the book with you and make payment arrangements.